Today I tried CASE-ing Anna-Karin at Layers of Ink. On Anna's project she used a Mason Jar die. I don't have the die so I made a scene and die cut a Spellbinders frame around it. The technique Anna used is ink to acrylic block. I used two Versa Fine inks from TSUKINEKO - VFS- 62 Spanish Moss and VFS - 52 Toffee. I stamped the large flower with Stampin' Up! Cajun Craze and Old Olive for the stem. Then I stamped the other flowers with Versa Mark and heat embossed with Ranger Seafoam White. I have tried the ink to acrylic block technique before but in a more controlled manner. I think this "fly by the seat of your pants" way is more interesting and FUN! Be sure to pop over to Anna-Karin's blog at Layers of Ink and see her Mason Jar project. It is totally awesome!!! Hi Betty! This is wonderful! 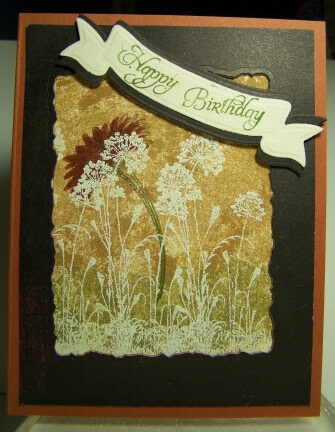 Love the earthy colours and the stamps that you used. The frame and banner are really pretty. I am glad you were inspired by my tutorial! Thank you for sending me the link to your card!